Ages 3 and up. This instrument provides information that will be useful in identifying problems during pregnancy, health issues, etc. that may be relevant to performance in school. Hearing loss, communication problems, problems during pregnancy, family customs, and other important factors are examined. All questions are listed in English and Spanish. 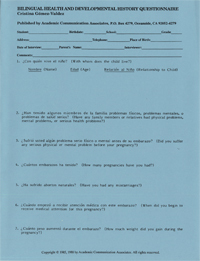 Thirty copies of the questionnaire are included.